Sierra Electronics welcomes you to our full Products section. We at Sierra Electronics have always strived to bring you our valued customers the best in customer service, high quality products and very competitive pricing. 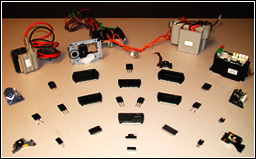 Our Products section will allow you to browse through our extensive list of Semiconductors, a wide range of Flybacks, an expanded list of Optical CD Pickup Heads, Tuners, Capacitors and all related products.